Toronto, ON  Moved by the ongoing social and environmental devastation caused by the Chornobyl nuclear disaster of 1986, more than 250 Canadian singers and musicians will take to the stage for Chornobyl 20, a memorial fundraising concert on Sunday, April 9, 2006 at 7 p.m. at Roy Thomson Hall (60 Simcoe Street). Presented by Children Of Chornobyl Canadian Fund (CCCF) and featuring performances by acclaimed bass-baritone Pavlo Hunka, the Juno award-winning Gryphon Trio, The Amadeus Choir, The Orpheus Choir, The Elmer Iseler Singers, Vesnivka Choir, and Toronto Ukrainian Male Chamber Choir, Chornobyl 20 is an acknowledgement of the lives lost and the human suffering sustained as a result of the Chornobyl nuclear disaster on April 26, 1986. 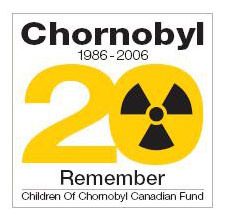 "Through Chornobyl 20 we hope to impress upon Canadians the need for continuing vigilance by governments of the world to ensure that such catastrophic events never happen again," said Roman Stepczuk, President and Chairman of Children Of Chornobyl Canadian Fund. "Two decades later, the aftermath of radiation exposure continues to take a severe toll on the health and welfare of the people living in the Chornobyl affected zones." The concert features the world premiere of Wormwood a cantata by acclaimed Canadian composer Christos Hatzis commissioned by the Gryphon Trio, and performed by the Trio, bass-baritone Pavlo Hunka, and all five choirs. Shortly before starting the composition, Hatzis learned that 'Chornobyl' (the Ukrainian name for Chernobyl) meant 'Wormwood', the English word for Apsinthos. In the Book of Revelation, Apsinthos is the name of the 'death star' that was hurled to the earth and poisoned the planet's waters, causing a great many people to die. Hatzis used passages from chapters eight and nine of the Book of Revelation to provide most of the text for this work. The program also includes Blessed is the Man (2002) by Oleksandr Kozarenko, Roman Hurko's Requiem for the Victims of Chornobyl (2001), Srul Irving Glick's The Hour has Come 'A Choral Symphony'(1985), and two multi-media presentations designed by Jacques Collin featuring CCCF archival footage and images by Montreal - born photographer Robert Polidori which depict the aftermath of the Chornobyl disaster. Proceeds from Chornobyl 20 will fund the purchase of diagnostic medical equipment for hospitals within the Chornobyl zones. Tickets for Chornobyl 20 are $20 - $75 and may be purchased by calling the Roy Thomson Hall Box Office at 416-872-4255 or Ticketmaster at 416-870-8000 or online at www.roythomson.com or www.ticketmaster.ca . Tickets to the Post- Performance Reception are $125 (which includes a $75.00 concert ticket) and are only available by calling CCCF at 416- 604-4611. Note: 'Chornobyl' is the transliteration from the Ukrainian name of the town in Ukraine. It is also known as 'Chernobyl', which is transliterated from the Russian spelling.